ST THOMAS, USVI — Federal Bureau of Investigation detectives along with V.I.P.D. 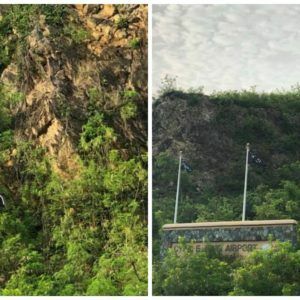 officers descended on the entrance of the Cyril E. King Airport this morning, after it was discovered that the USA, US Virgin Islands (USVI) and nine other flags that normally hang high on a welcome monument at the beginning of the road heading to the airport, were replaced with black flags bearing the name “Allah” on them. In a release issued at 10:28 AM, this morning, the Virgin Islands Port Authority said it had launched an investigation into the removal of the flags. The authority said its law enforcement officers reported that upon arrival to the airport early this morning, they noticed that all the flags were removed from the 11 poles at the monument and replaced with black flags. The flags have since been removed. The Port Authority said it has reported the incident to the F.B.I., the Transportation Security Administration (T.S.A.) and the Virgin Islands Police Department. “The matter is still under investigation. Security at the airport has been heightened. The Cyril E. King Airport will remain open and functioning as normal, and all flights will arrive and depart as scheduled,” the Port Authority release said. you only do what you're told. never listen to the private citizen who knows more. dumb F---kers. that means the airlines will only serve food 'ala carte' ha ha ha.....cutting down on costs. I would like to know who took the time and effort to remove. All the flags and put up new ones. Aren’t there cameras around the place? This is dangerously too close to home here. Some one drop the darn ball on surveillance here. You on good behaviour for the tourist dollar huh.